The similar programs have already been in place in all these 4 countries i.e. Student Partner Program (SPP) in India. With SDS, IRCC has aligned all those programs together for all 4 countries to ensure consistency. They also plan to expand SDS in few more countries in coming time. To qualify for SDS, Applicants need to meet specific requirements and submit relevant documents as summarized below. 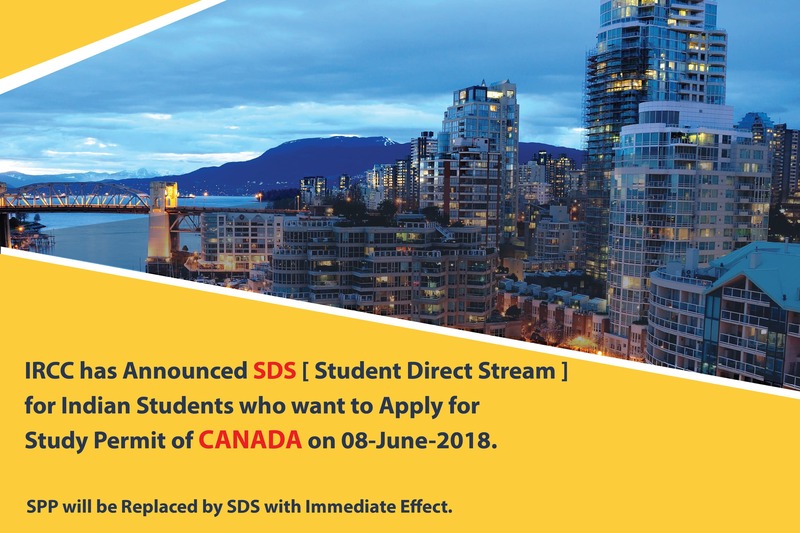 The remarkable differences in SDS over SPP are Increased Level of IELTS Result, Payment of First Year Tuition Fees, and Selection of any Designated Learning Institution of Canada. IRCC intends faster processing of Study Permit Applications under SDS over Regular Applications. Students accepted by Universities in Canada can still apply under “University Students” stream and they can follow the requirements as summarized in the relevant checklist, and majority of the requirements are similar to SDS. Students, who do not meet the above criteria, can very well apply for Study Permit Applications and their Applications will be considered under normal / general applications. Students from India can submit their Study Permit Application Online or submit Paper Application at nearest Visa Application Centre. The processing time for Study Permit Applications may vary throughout the year depending on the volume of applications. The SDS complements the Express Entry system as these students will be well placed to continue on the path to Permanent Residence in Canada after completion of their program of study in Canada. IRCC recognized the tremendous economic, cultural and social benefits that international students bring to Canada. IRCC is committed to finding ways to improve its International Student Program by making its services faster, easier and more accessible.. The success of SDS Program will be evaluated with intension of further expansion.